Normalizing is the term applied to the process of heating the steel approximately 4 above the critical temperature followed by cooling below this range in still air. This is one of the simplest treatment. Due to air cooling which is slightly fast as compared to furnace cooling employed in full annealing, normalised components show slightly different structure and properties than annealed components. 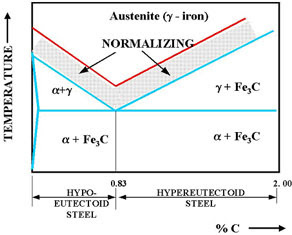 The steel produced by this treatment is harder and stronger but less ductile than annealed steel having the same composition. This treatment is frequently applied to castings, forgings, etc., to refine grain structure and to relieve stresses set up in previous operations. It is commonly applied after cold working, overheating, or any other operation resulting in non-uniform heating or cooling. To eliminate coarse gain structure obtained during forging, rolling, and stamping. To improve machinability of low carbon steels. To increase strength of medium carbon steel. To improve structure of welds. To achieve desired results in mechanical and electrical properties.